The look of the 2017 Ssangyong Rexton will be previewed in Ssangyong's LIV-2 concept that's headed to the Paris motor show later this month. 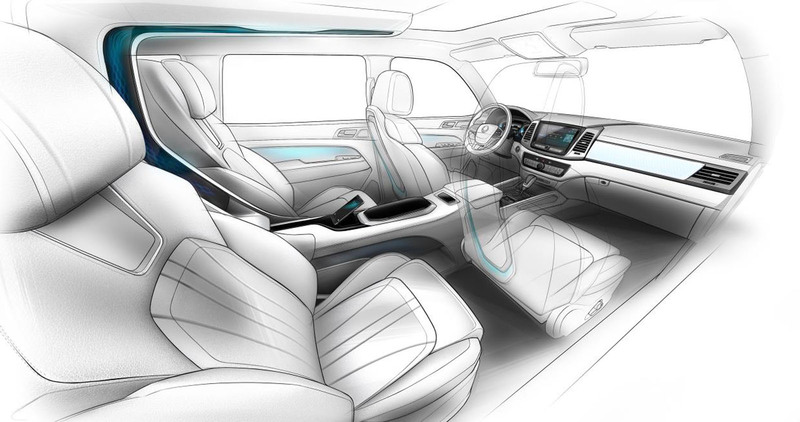 The LIV-2 – which stands for Limitless Interface Vehicle – is the final concept for the Y400 development model, a large SUV that Sssangyong has been working on in recent years. It’s an evolution of the LIV-1 concept that was shown at the Seoul motor show in 2013. The LIV-2 is powered by a 2.2-litre Euro 6-compliant diesel engine or a 2.0-litre GDI petrol unit. Both engines are expected to be seen in the production Rexton, which will rival the Hyundai Santa Fe when it launches next year with a starting price below £30,000. The design language shown in these rendered images has moved on from that of previous models and follows a concept that Ssangyong calls ‘dignified motion’. Little information has been released about the concept, but Ssangyong promises high levels of safety, a luxury interior and advanced communication technology. The new Rexton is part of a revival that has seen Ssangyong move from the brink of bankruptcy in 2009 to expanding sales in 2016. In the UK, sales increased from just 280 units in 2010 to 3600 in 2015, and Ssangyong UK's CEO told Autocar in June that he expects 6000 sales in 2016. The Rexton, along with other new models including a crew-cab pick-up in 2018 and a replacement for the Korando in 2019, could drive sales up to 10,000 units per year. Ssangyong is also considering the introduction of another small SUV, based on the XAV concept, to sit alongside the Tivoli and target the youth market. The arrival of the Korando replacement could also herald the start of an assault on the US market. Ssangyong CEO Johng-sik Choi believes that it would be possible to hit 50,000 sales per year in the US, which would help considerably with achieving his vision of 500,000 sales globally each year. The South Korean firm sold around 170,000 units around the world in 2015. Click here to view spy pictures of Ssangyong's 2017 Rexton.